Stackbin machine stands feature full arc welded construction and a weight capacity of 3500 pounds. Standard machine stand dimensions are 20" deep by 30" wide with a 31-1/2" work height. Bottom shelf is included standard and optional middle shelves are available. Top shelf is constructed with 13 gauge steel and 14 gauge is used for bottom and middle shelves. 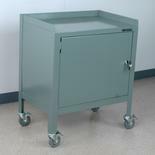 Machine stands can also be outfitted with 16" depth stackable drawer units for added storage. We can also enclose any of the lower portions of these units to create a lockable cabinet for items stored below.